During the course of the war in Iraq, many veterans have become increasingly disillusioned, and increasingly vocal. Many began seeing the war as damaging for the country, and especially for the men and women fighting overseas. In My River Home, Marcus Eriksen, a veteran of the Gulf War, charts his personal shift from proud Marine to self-destructive veteran to engaged activist protesting the injustices of the Iraq War with Veterans for Peace. 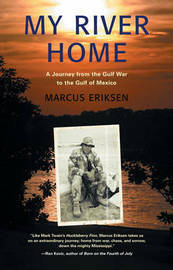 Eriksen made sense of this transition only after a fascinating adventure traveling through the heart of America, down the entire length of the great Mississippi River on a homemade raft.